A great children’s classic! Retelling this story is fun! Try starting this story with a different concept. Maybe the giant is actually friendly and it only sounds as if he says mean things. Maybe he comes down from the stalk and helps the poor? Maybe the golden egg goose stops laying eggs unless she gets 5 magic beans? These little guys prompted me to write an entire story. 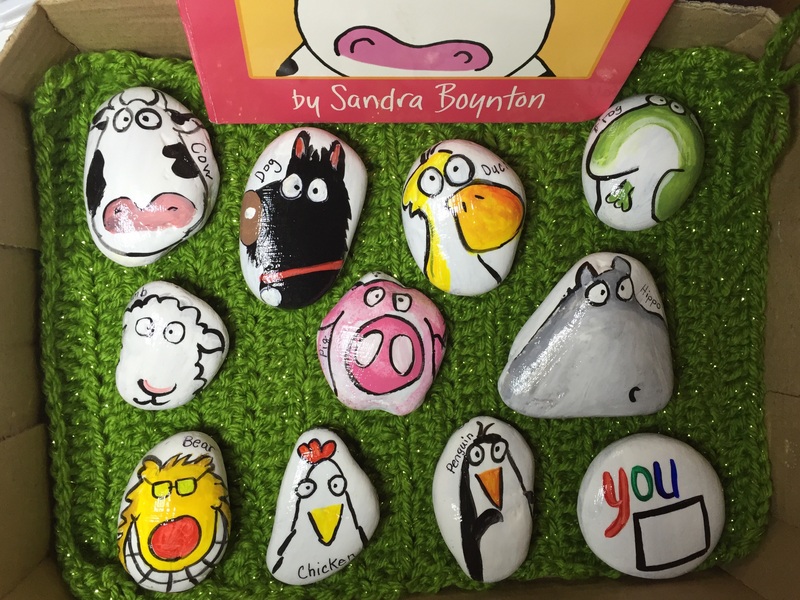 There is something about holding the stone and peering into the eyes of these little guys that sparked my creativity. 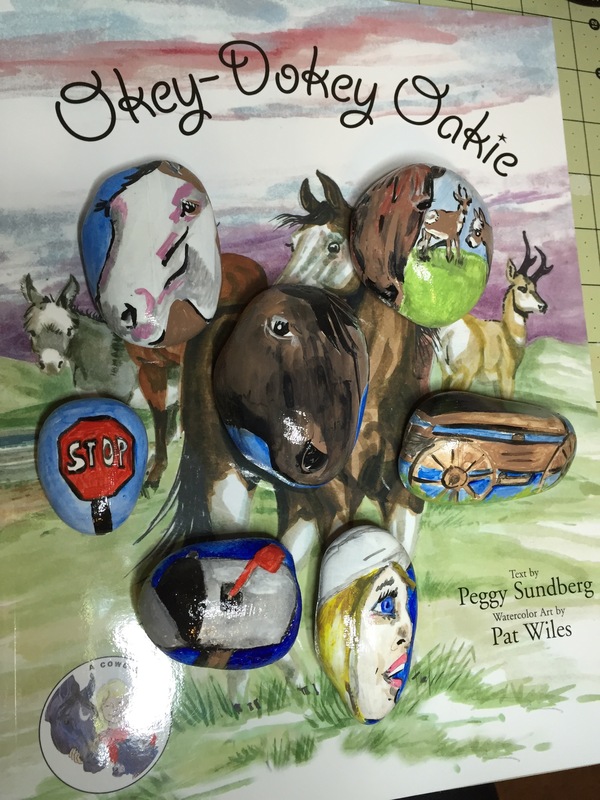 My Sister in Law loves horses and brought me a children’s book to have me create some stones for her. It is so gratifying for me that people love these stones. So do I. Little Red Riding Hood. She should’ve listened to her mother and stayed on the path to take those blueberry muffins to grandma. These stones can be discussed as a moral lesson. Parents know best and have reasons behind seemingly arbitrary rules. 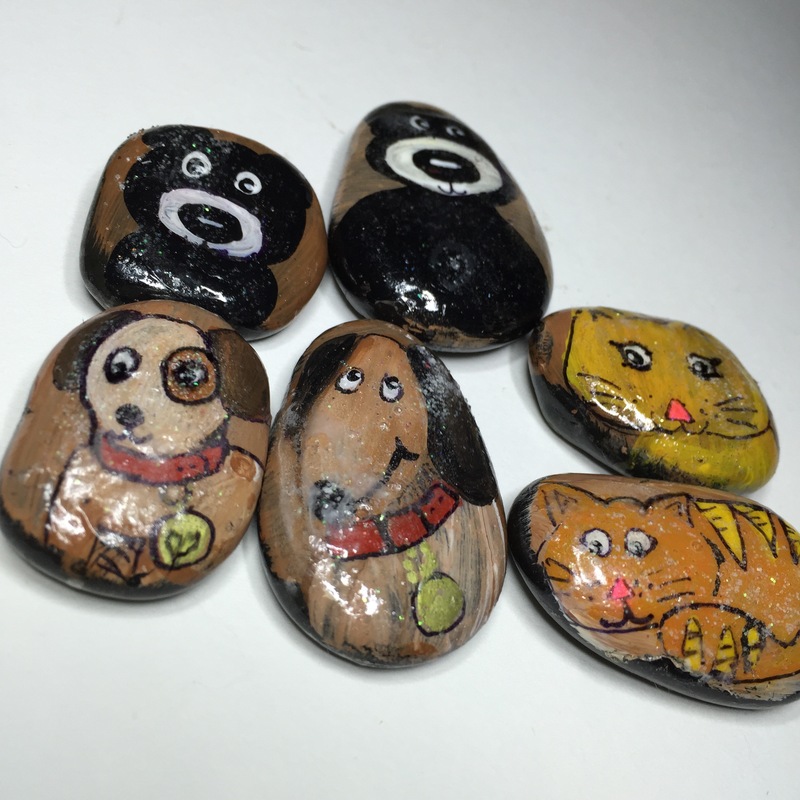 Try using these stones as a family game. Place them in the middle of the table and the youngest takes a stone and starts off a story. Either the well loved tale or a new one. Each family member must restate the story as they go along and add a detail as they draw their stone. 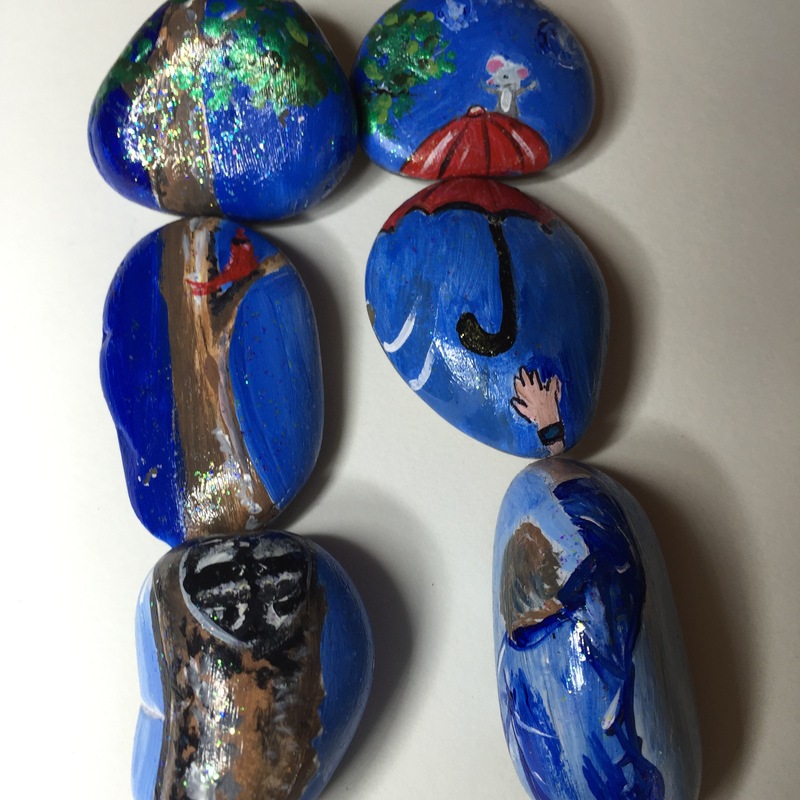 In this set of story stones a little gray mouse has just taken off with a gust of wind on top of the red umbrella. The boy in the blue jacket is just almost able to reach the umbrella to save the little mouse. I am sure that the raccoon in the tree knows exactly what has happened and maybe could tell his story. Perhaps the red cardinal perched on the branch is a secret agent who knows exactly what the mouse is doing. I think you get the idea. Begin with a character or an idea and build your story. Enjoy making different combinations. 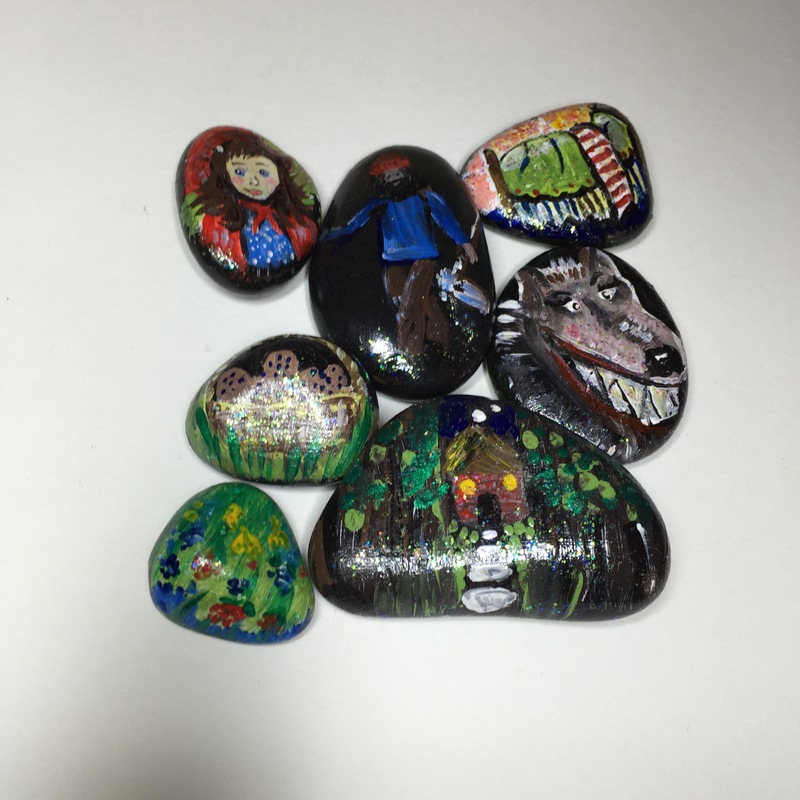 I began my first adventure with story stones as a gift for my grandson and I have since done several sets of stones that I have given away. How I wish that I had taken a picture of all of them but you can’t go back and fix things like that. I’m usually only very interested in doing the art and am now reforming and trying to get interested in the art of the blog and the Internet and putting my pictures of my work out so that I can show them to people. You might be wondering what story stones are good for. Right? 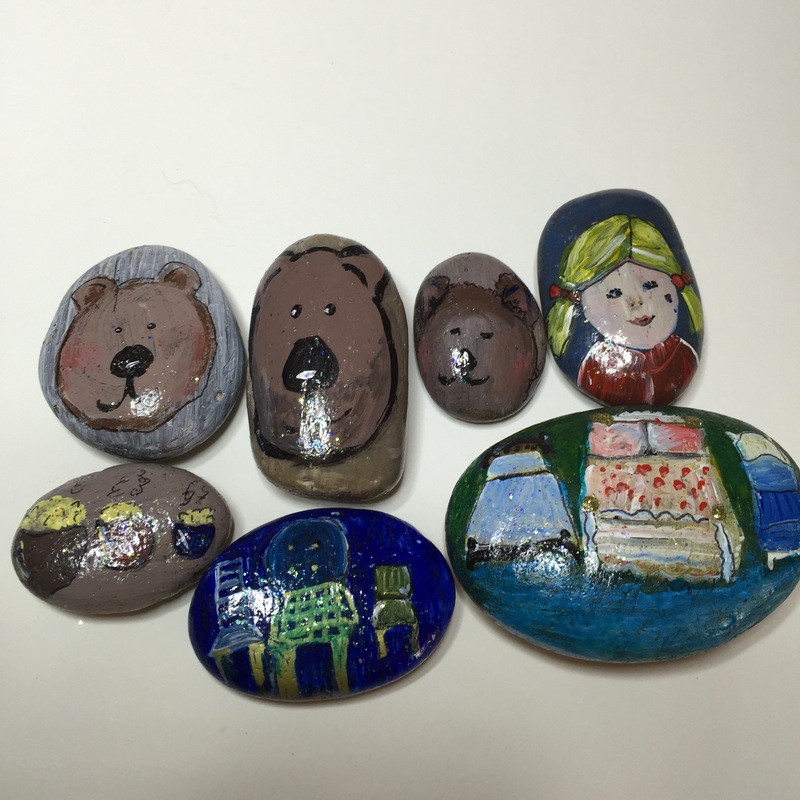 The way you can use this set of story stones … The three bears… is to try to tell the story using the stones in the order that the story takes place for instance, the three Bears have just sat down to their hot porridge and they cannot eat it because it’s of course too hot so they go for a walk and during this time Goldilocks comes in and tries the porridge. Then she sits in the chairs and lays on the beds and when the three bears come home they find her in the baby’s bed asleep. It is a favorite fairytale and an old one that many people will enjoy young and old alike. 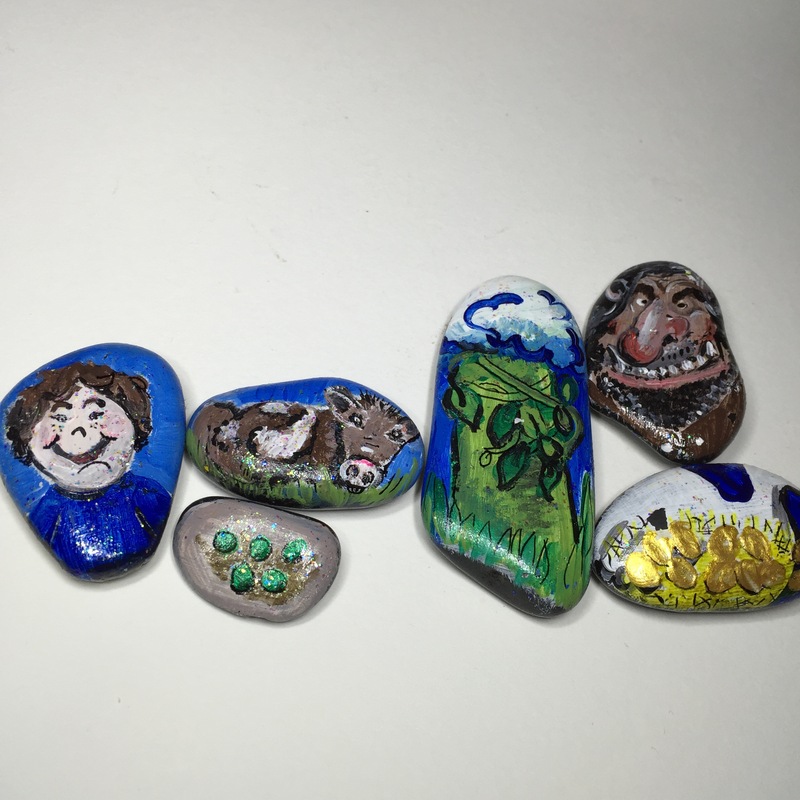 The stones are meant to be enjoyed along with the story. I found that YouTube is a treasure trove of children’s stories. If you don’t have the book, check out a YouTube reading. See if you can invent your own story. There are also games you can play but that is for another post.